Arctic drilling may be delayed until next year, because Shell’s oil-containment vessel is still not ready, according to Secretary of Interior Ken Salazar. “I will hold their feet to the fire in terms of making sure that we are doing everything we can to abide by the standards and regulations we have set, and to make sure that the environment and the Arctic seas are protected,” Salazar said during a press conference in Anchorage. A shell spokesman expressed hope that the drilling would still begin this fall. For details, see the stories by Lisa Demer of the Anchorage Daily News and Olga Belogolova of the National Journal. The Greenpeace ship Esperanza is not sitting around waiting for Shell to begin its drilling in the Alaskan Arctic. Greenpeace biologists have reported the presence of a soft coral at the drill site. I’m not sure how significant this is, but Julie Eilperin of the Washington Post has the story. Greenpeace has the photo. 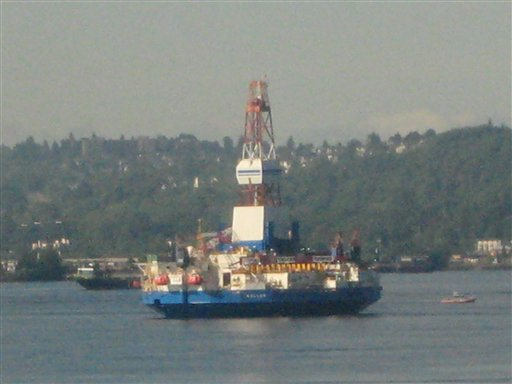 The U.S. Department of Interior released a five-year plan for oil and gas leases yesterday, as two Shell exploratory rigs headed out of Puget Sound on their way to the Alaskan Arctic. The Shell drilling vessels Kulluk and Noble Discoverer were headed for Alaska’s Dutch Harbor, where they will wait until the ice clears in Beaufort and Chukchi seas. See Vigor’s news release about alterations made to the two rigs. This week, the Obama administration will announce a five-year program for offshore oil-leasing. It will include targeted areas for exploration and drilling in Alaska’s Arctic, Secretary of Interior Ken Salazar said yesterday. Salazar said permits to allow Shell to conduct exploratory drilling in the Arctic, as we have discussed in this blog, are likely to be issued soon. Associated Press writer Dan Joling does a nice job explaining Salazar’s comments. See Seattle Post-Intelligencer. 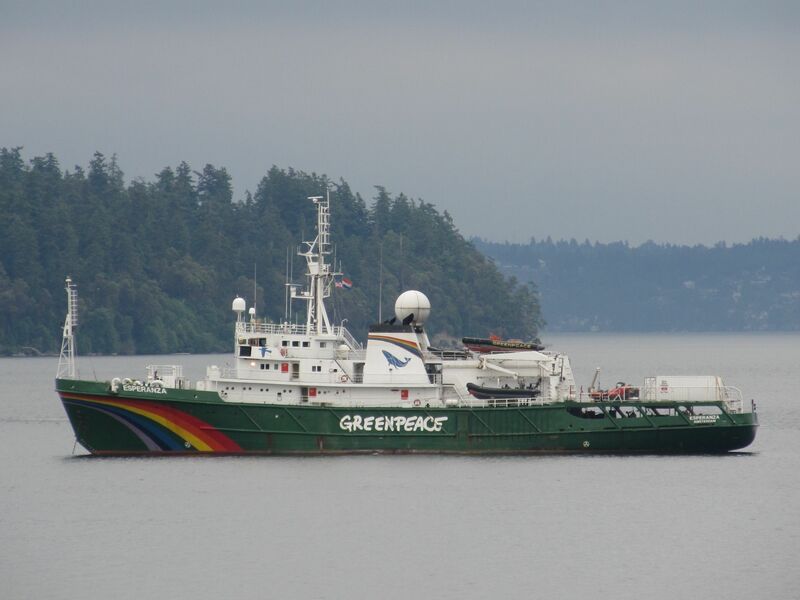 The Greenpeace ship Esperanza has arrived in Alaskan waters. Photo posted on Twitter. UPDATE, June 12, 3 p.m. The Greenpeace ship Esperanza has left Seattle on its way to the Arctic, according to ongoing reports on Twitter. As of 3 p.m., the ship is just crossing the Edmonds-Kingston ferry lanes. UPDATE, June 12, 2:30 p.m.
I’ve added maps of the two drilling areas at the bottom of this post. After anchoring for nearly a week in South Kitsap’s Yukon Harbor, the Greenpeace ship Esperanza on Friday moved over to Seattle, where it now waits for Shell’s oil-drilling rigs to shove off for Alaska. The Greenpeace ship Esperanza was anchored in Yukon Harbor for nearly a week. Shell obtained an injunction (PDF 32 kb) against Greenpeace in hopes of preventing environmental activists from boarding its oil rig and unfurling banners or causing more serious damage. “After obtaining multiple approvals from various federal agencies, and after completing preparations that have been years and billions of dollars in the making, Shell intends to lawfully, safely, and responsibly carry out an exploration drilling program on its leases in the Chukchi Sea and Beaufort Sea in the summer of 2012. Greenpeace says its goal is to shadow the oil rigs and document the activities from miniature submarines to help the public understand the dangers that drilling poses to the fragile Arctic ecosystem. See Kitsap Sun, June 4. For environmentalists, the biggest question is: How did this drilling ever get approval? Why did a Democratic president allow Shell to get all the permits necessary to explore for oil in the Arctic, after strong opposition through the years succeeded in keeping drilling rigs out of the Arctic. “Beyond the usual full-court lobbying effort, Shell abandoned its oil industry brethren and joined advocates pushing for a strong response to climate change. “Ultimately, Shell won the backing of a president it had viewed warily during the 2008 campaign. While he signaled conditional support for the proposal years ago, Mr. Obama came under pressure from rising gasoline prices and the assiduous lobbying of a freshman Democratic senator from Alaska eager to show he could make things happen in Washington. “The government strengthened its Arctic research programs to better understand the impact of increased industrial activity in the northern ocean. Those and other concessions seemed to placate officials at the permitting agencies, who were navigating between their regulatory duties and the president’s obvious desire to drill. As far as I can tell, Shell is waiting only for its final drilling permits from the Department of Interior and for the ice to clear in the Chukchi and Beaufort seas. 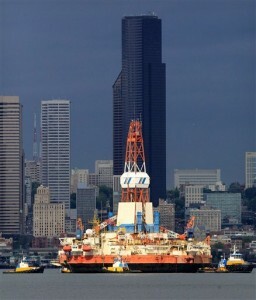 Shell's oil-drilling rig Kulluk prepares to head for Alaska. This photo was taken last year on its way into Seattle. 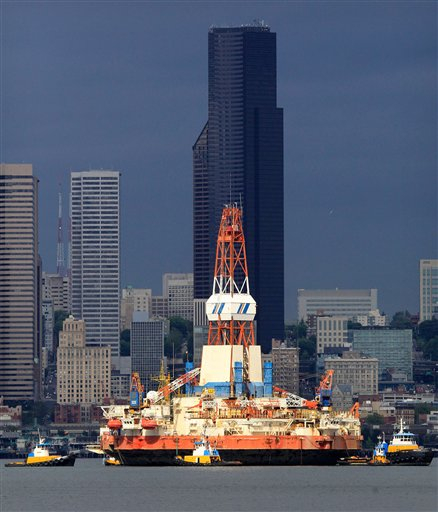 As Shell’s oil rigs prepare to pull out of Seattle, Alaska’s governor and the state’s two U.S. senators recently visited Seattle to take a look at Shell’s oil rigs on the eve of the historic drilling activity, as reported by Jennifer A. Dlouhy of the Houston Chronicle. The article also included environmental concerns about an oil spill in the fragile Arctic ecosystem, which could be worse than the Exxon Valdez in Prince Williams Sound, where oil is still showing up 23 years after a multibillion-dollar cleanup. “If there is a spill in the Arctic, the oil and damage will almost certainly degrade slower and last longer,” Richard Steiner, former marine conservation professor at the University of Alaska was quoted as saying. President Obama signed the Coast Guard Authorization Bill today. For details, check out the news release from U.S. Sen. Maria Cantwell. President Obama is expected to sign a sweeping authorization bill that reorganizes U.S Coast Guard operations, increases maritime safety rules and calls for improved oil-spill prevention and response in the Strait of Juan de Fuca. It seems this bill has something for everyone, at least among those of us living in coastal states. By skimming through the Coast Guard bill or reading a summary, you get an idea of just how sweeping these changes will be for the Coast Guard. The legislation, largely written by Sen. Maria Cantwell of Washington, was blocked by Republican leaders in the Senate for the past four years. To get approval, several provisions were stripped from the bill in the Senate. Then in the House, many of these ideas were put back in and ultimately approved when it came back to the Senate. What are the most important parts of the bill? Well, that depends on whether you are involved in the Coast Guard, the shipping industry, the fishing fleet or just want to protect against oil spills or terrorists. Washington state officials were wondering if spill responders would be ready for an oil spill in Puget Sound this week, given that 26 of the most knowledgeable contract employees had been sent to assist in the Gulf of Mexico. So officials with the Washington Department of Ecology announced a surprise drill today, calling on Marine Spill Response Corporation and its subcontractors to respond to six pretend spills all at the same time. “This was the first time we have ever been involved in a simultaneous unannounced drill in multiple locations,” said Curt Hart, media relations manager for Ecology’s spill program. MSRC serves as the response contractor for 20 regulated oil-handling and shipping companies in Washington state. With 26 top-level people gone from MSRC in this region, much the responsibility fell to Global Diving and Salvage, a company that normally get assignments for specific tasks. In this case, Global officials played a key role in calling the shots. Ecology had been stressing to MSRC that the company should send people to help in the Gulf but not if it had to reduce its response in Puget Sound. Today’s exercise tested that agreement, including the capabilities of Global as it “backfilled” for MSRC. Hart seemed pleased with the outcome. First-level responders and their equipment were generally ready at the terminals where the simulated spills took place, and additional equipment was called into play. The locations of the simulated spills were in Anacortes, Bellingham, Port Angeles, Seattle and Tacoma, with Neah Bay added at the last minute. The drill ultimately called out 16 vessels and 41 personnel. The drill tested communications and equipment. “We held their feet to the fire,” Hart told me. While today’s simultaneous exercise was a first, another 50 drills are scheduled through the rest of the year to test all aspects of the industry’s oil-spill contingency plans, according to Hart. In addition to the drills, Ecology inspectors have conducted 23 inspections this year to make sure equipment is available and ready, he said. With 22 billion gallons of oil transferred across Puget Sound each year, the risks of a spill are very real, Curt said, despite an extensive prevention program, which includes placing boom around ships during oil transfers whenever practical. Ecology is maintaining a list of equipment and personnel requested or deployed in the Gulf oil spill.